Dry. In Minnesota, dry sand-gravel prairies and steep bedrock bluff prairies. Steep, south-facing, weathered, dolomitic sandstone bluffs. Full sun. This is an erect or ascending, perennial forb that rises on several stems from a stout woody base (caudex) and a deep root system. The caudex may be unbranched or have a few branches. It does not form dense mats. The stems and leaves are densely and evenly covered with short, four- to seven-branched, star-shaped, unstalked or short-stalked hairs. The plant at first appears in April as a rosette of 35 to 58 basal leaves. Basal leaves are erect, narrow, unlobed, ¾″ to 3½″ long, and up to ⅜″ wide. There are usually some unbranched hairs near the base. The margins are usually untoothed, rarely shallowly toothed. Inner leaves are narrowly lance-shaped to linear with margins rolled to the upper side. Outer leaves are inversely lance-shaped and flat. Basal leaves are present at flowering time. In late April or early May several stems rise from the basal rosette. The stems can be 4″ to 16″ tall, but are usually no more than 10″ in height. The inner stems are erect, the outer stems are ascending, and usually some are reclining on the ground with only the tips ascending (decumbent). Stem leaves are few and are similar to basal leaves. They are narrowly inversely lance-shaped to linear and ¾″ to 1½″ long, becoming progressively shorter as they ascend the stem. Upper stem leaves are stalkless and taper to the base. The margins may be flat or rolled toward the upper side. The inflorescence is a compact, dense, unbranched cluster (raceme) of 10 to 70 flowers at the end of each stem. The flowers bloom from the base upward. Each flower is about ¼″ long and ¼″ to ⅜″ wide, on a hairy, ⅜″ to ¾″ long stalk. It has 4 sepals, 4 petals, 6 stamens, and 1 style. The sepals are yellow, hairy, oblong to elliptic, narrowly angled at the tip, and ⅛″ to ¼″ long. They are erect at first, soon spreading widely. 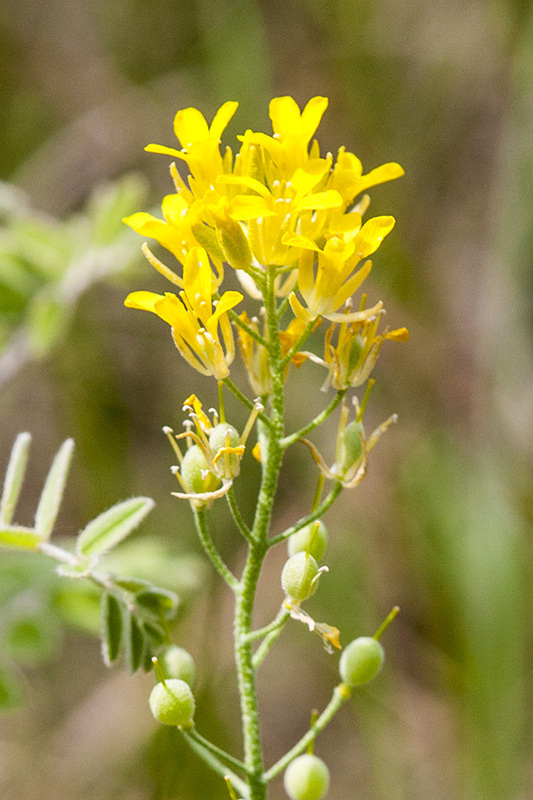 The petals are yellow, inversely lance-shaped or egg-shaped, ¼″ to ⅜″ long, and 1 ⁄16″ to ⅛″ wide. They are sometimes narrowed gradually to a stalk-like base (clawed). The stamens have yellow filaments and forked anthers. The two inner pairs of stamens are longer than the one outer pair. At the base of the small stamens there is a pair of nectar glands that blend into one another. The ovary is above the point of attachment of the petals (superior). It is covered with spreading, branched, star-shaped hairs. The style is slender, unbranched, hairy at the base, and 1 ⁄16″ to ⅛″ long. As the earliest flowers drop their petals and produce fruit, the raceme elongates, eventually to about 6″ long. The fruit is a green, inflated, egg-shaped or almost globe-shaped, ⅛″ to ¼″ long pod. The pod has 2 chambers separated by a narrow partition. There are 4 to 6 seeds in each chamber. It is covered with spreading, branched, star-shaped hairs. The style remains attached to the maturing fruit. When the fruit matures the pedicel eventually curves strongly downward. Sources: 2, 3, 4, 5, 6, 7, 28, 29, 30, 72. 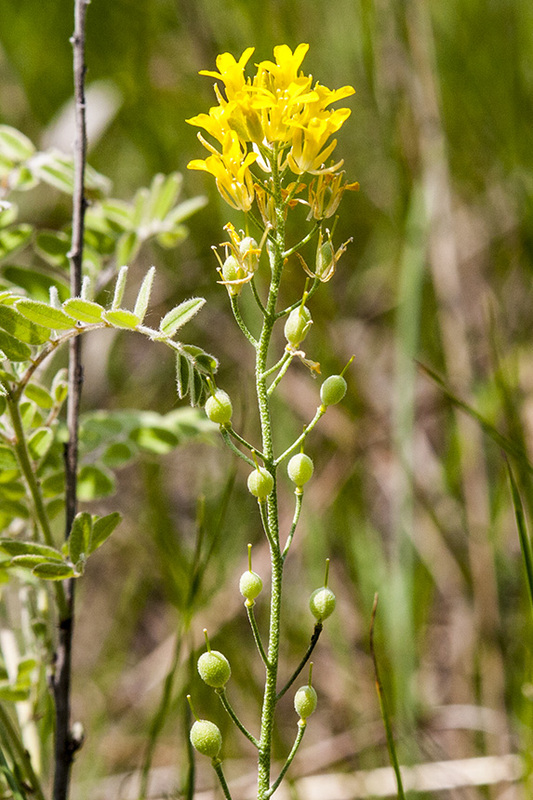 Spring Creek Prairie SNA has one of the largest known populations of this plant. Most of the other populations are within the city limits of Redwing. 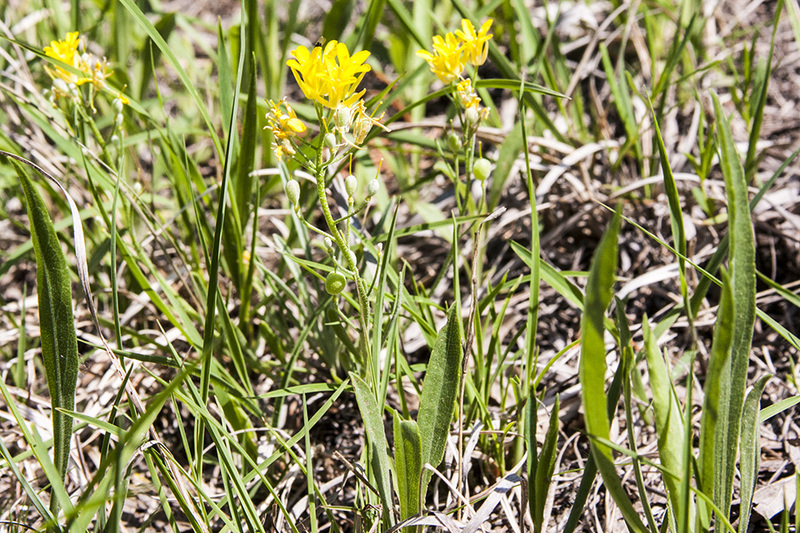 Look for it on exposed, sandy soils on south-facing bluffs. This plant was formerly classified as Lesquerella ludoviciana. The natural range of this plant is from Montana and North Dakota, south to New Mexico and Arizona, and north to Manitoba and Saskatchewan. The few known populations in Minnesota may have been transplanted by a seed dropped by a bird, or may have survived from a time when the central plains extended into the area long ago. 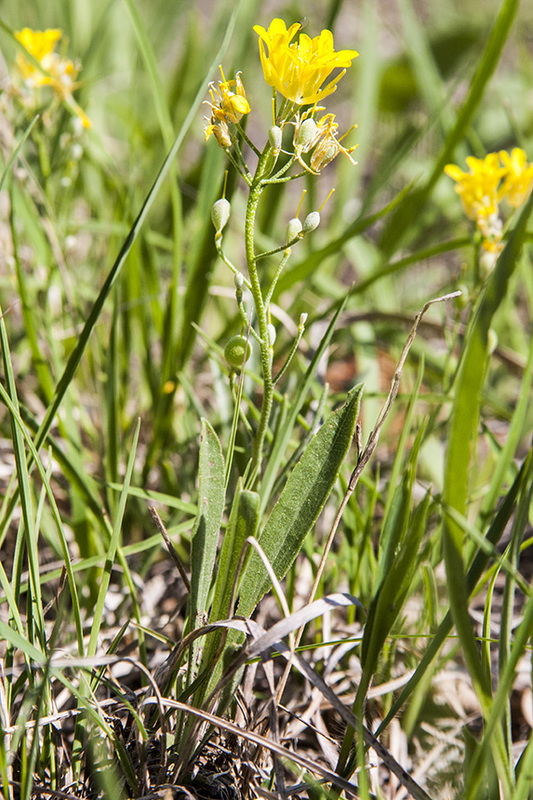 There are at least 78 species of bladderpod (genus Physaria) recognized in North America. Most of them are restricted to western United States. 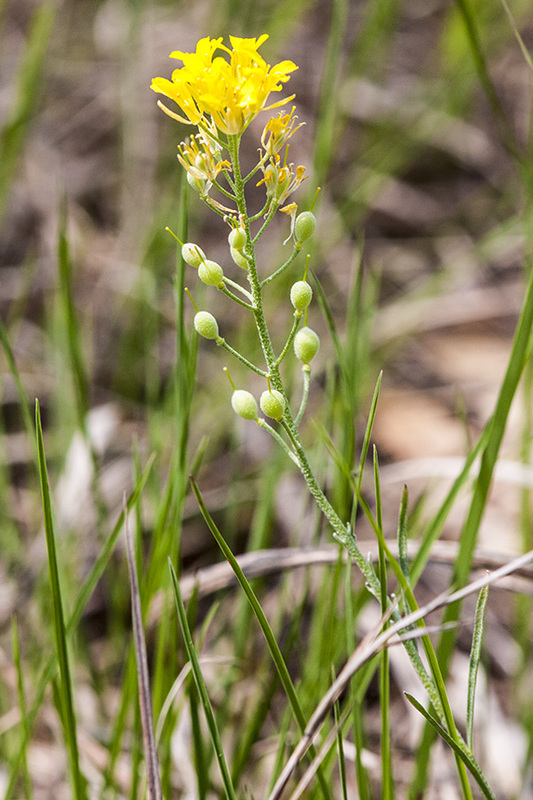 Only Louisiana bladderpod (Physaria ludoviciana) is found in Minnesota. The natural range of this plant is from Montana and North Dakota, south to New Mexico and Arizona, and north to Manitoba and Saskatchewan. In Minnesota it is found in full sun growing on sandy soil on steep, south-facing, weathered, dolomitic sandstone bluffs. Spring Creek Prairie SNA has one of the largest known populations. Most of the other populations are within the city limits of Redwing. 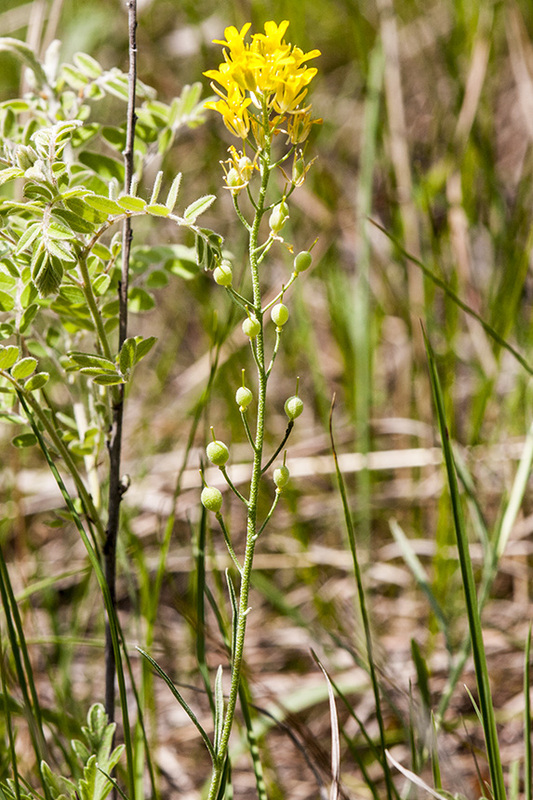 Louisiana bladderpod is is common in its natural range but is classified as endangered in Minnesota and Illinois, threatened in Wisconsin. The few known populations in Minnesota may have been transplanted by a seed dropped by a bird, or may have survived from a time when the central plains extended into the area long ago. 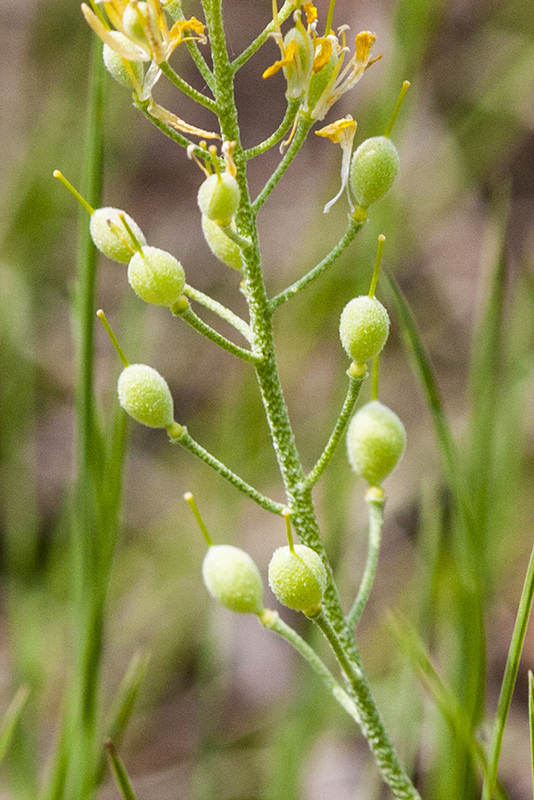 Louisiana bladderpod is identified by its narrow, unlobed leaves forming a basal rosette; yellow flowers; and inflated, hairy, more or less globe-shaped fruit. There are no similar species in Minnesota. Reclining on the ground but with the tips ascending.